It doesn’t seem that long ago that we got into an ill-advised war with Iraq. We now know some of the truths and myths about “weapons of mass destruction,” and Saddam Hussein. Saddam and his sons were brutal dictators, but you have to wonder what the middle east would look like today if we had contained the insanity of that madman rather than going to war with him. It was on this day, in 2003 that, former Iraqi dictator Saddam Hussein, spending nine months on the run, was captured. His spiral down to a hole in the ground began on March 20, 2003, when the United States invaded Iraq. It had been a 20 year dictatorship focused on genoside and violence toward his own people. The brutal, some say insane dictator, Saddam Hussein was born in Tikrit, 100 miles from of Baghdad. As a teenager, Saddam joined the Baath party, in which he rose to leadership. He was involved in several coup attempts, which led to installing his cousin as dictator of Iraq in July 1968. Saddam took over for his cousin 11 years later. Saddam’s secret police terrorized the people, ignored human rights of the citizens, and promoted terrorism. He lived in the lap of luxury, building over twenty palaces, while most of his people faced poverty. 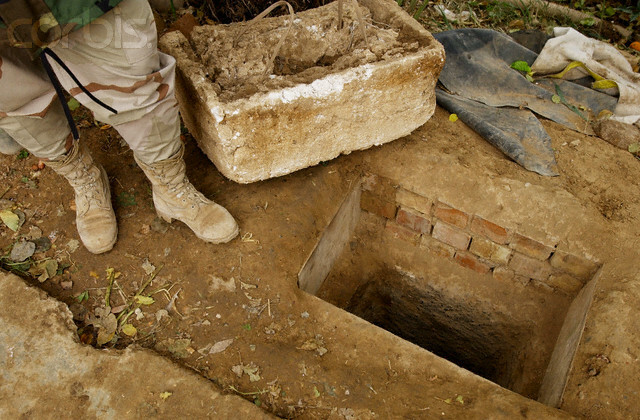 But on this day, December 13, 2003, U.S. soldiers found Saddam Hussein hiding in a eight-foot deep hole, nine miles outside his hometown. One soldier during the capture described him as “a man resigned to his fate.” From luxury to living like a rat this was the final chapter for the dictator, Saddam Hussein. I've been a pastor, spiritual director, and spiritual coach and worked with thousands of people over the years. You can find the life the Creator intended for you. Contact me if you want to find out more. This entry was posted in Coach's Blog, denny meyer, life coach, Sonrise Coach, Spiritual Coach - Denny Meyer, spiritual coaching and tagged capture, coach denny meyer, denny meyer, Iraq, pastor dennis meyer, Saddam Hussein, spiritual coach, spiritual coach denny meyer, spiritual coaching. Bookmark the permalink.